Find out more about PROfarm. See the list of all courses available. A range of diagnostic tests to assist vets and growers are available at the NSW DPI Laboratory Services. Can have serious consequences for trade, production or human health. 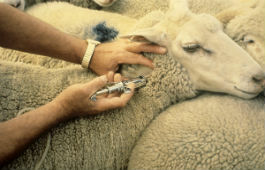 Contact a vet or call the Animal Biosecurity Emergency Hotline on 1800 675 888 if you see symptoms or deaths in animals that may be due to a prohibited matter pest or disease of animals. People who keep sheep are expected to be informed about the general requirements for feed, water, shelter and routine treatments such as worm control and vaccinations which are needed to keep all sheep healthy. A number of animal diseases, including all emergency animal diseases, are notifiable under NSW legislation. This means there is a legal obligation to notify authorities if you know or suspect an animal has one of these diseases. You can use this form to notify knowledge or suspicion of a notifiable animal disease. The general biosecurity duty, and how to avoid health hazards. LiceBoss is a decision support system that can help woolgrowers determine the need for a louse treatment, choose the most cost effective control option and minimise residues. FlyBoss provides the latest information to reduce the risk through management and breeding and how to treat fly strike outbreaks.